Hoping for some advice as I am going insane. We adopted a rescue dog a month ago. He is a Tibetan spaniel cross. We went to the refuge and explained our circumstances – we live in an apartment in central Paris, with no car. They recommended Hobbes. He is completely beautiful but terribly reactive to other dogs. Walks are a nightmare. He can't even see another dog on the other side of the street without going crazy, barking and lunging. I think he could harm another dog if he got close enough. Today two little dogs popped out of nowhere in front of us. They started barking, so did he and I got bitten (by Hobbes) putting myself in between them. A week ago, he slipped his harness and ran into traffic. He wouldn't let anyone come near him and I caught him only out of a lucky break. We have now bought an 'escape-proof' harness which is really secure but I'm paranoid about losing him again. I am really traumatised by both these events, and now walking him is a source of immense anxiety and terror. There are dogs everywhere in Paris, and trying to avoid them is an impossible obstacle course. I have tried walking him mid-morning and at night (not ideal, as I am also getting harassed by men while we are out walking). But there's really never a time when there aren't other dogs around. And I can't take him to larger parks outside the city because I don't have a car. We are trying with positive association training. We give him high-value (chicken, sausage) treats when he spots another dog and use them to lead him in the opposite direction. This works sometimes but not all the time, and I'm not seeing any consistent improvement in his behaviour over time. Currently he goes on four walks a day - a 45 minute walk around 10am, around the block at 2pm, another 45 minutes at 4pm and out for a pee at 10pm. When my partner is away for work I bring that down to three walks for my sanity. Each of them fills me with terror and I'm sure I'm transmitting that anxiety down the lead to Hobbes. But what can I do? I'm mortified. I've always had family dogs and have wanted one of our own for so many years. This was supposed to be a wonderful thing and it's turned into a nightmare. We adore Hobbes and he loves us. Spending time at home together is wonderful. I just don't know what to do about these walks. It seems likely that Hobbes was just a bit of a bad fit for our situation, but I want to avoid returning him to the refuge at all costs. I don't feel I can ask other people to walk him because he is so unpredictable. At this stage I need help as much as he does! I am consumed by anxiety that something will go wrong, shame that I'm not doing a better job with him, guilt that I'm not giving him the life he needs. I don't even feel I can talk to my friends about it because it will sound like I was stupid to adopt him in the first place. To be clear, he was silent when we met him in the refuge, and pulled on the lead when we walked him there but no problems with other dogs because we didn't encounter them either of the times we were with him. So it was a surprise when we discovered the behaviour. We have engaged a trainer but she can only see us every ten days or so and have only had one session in our home until now. 1. Dealing with an extremely leash-reactive dog in a big city. 2. Coping with your own anxiety after traumatic experiences out with your dog. I really need to know if this situation could get better. What was his situation like in the rescue? Was he in a kennel, and was he walked with other dogs there? Often dogs just don't show their true colours and their quirks when they're still in rescue. I'm not an expert, and it would be great if someone could come up with an alternative, but returning him to the rescue explaining the problem could very well be the best thing for Hobbes - he has a chance of being rehomed to someone with more open spaces. If you decide to do this you have in no way failed, and there's no reason why you couldn't adopt another dog who was able to cope with city life better. How old is he? Another option would be to reduce the length of his walks considerably, which would give him a better chance of 'successful' stress-free walks. If he gets stressed on one walk, the stress hormones won't have died down by the time he has his next walk (they can take days to return to normal), so he's already be primed to flip if he sees another dog. Im sorry you're having such problems . There is a book by Patricia McConnell called Feisty Fido Help the leash reactive dog which has lots of good advice. I have two dogs that tend to be reactive when they suddenly spot dogs or dogs run up to them and I use the methods in the book . I understand your panic when you spot other dogs and fear his reaction . It is a very common problem so you are not alone . If you think about it, Hobbes lost his home , went to kennels and ,luckily, has a new loving home and that is a lot of changes to go through and that makes him more reactive. It's possible he will show improvement following the right steps . You have had great advice, and do stay with us for moral support - you are doing a better job than you realise. You have only had him a month!!!! This WILL improve, but you have to move at Hobbes' speed. As already said, he has had a lot of changes in a short time - of course he's on a short fuse. Re: keeping him safe, use a double ended lead or two leads (it's easier than you think) one on a collar, one on the harness. Thus if one fails for any reason, you always have the other. Check out what you are feeding him. Some commercial foods have additives that act like blue Smarties on dogs. A change to something without sugars and colours can make a great difference. Thank you guys so much. I really did not expect such kindness from everyone. It helps so much and thank you for saying I am not getting everything wrong. I am trying my best but I never expected things to be so hard. Hobbes is two years old. He has really high energy levels at home and outside. Inside he likes to play (kill!) his soft toys. Sometimes he will bark for attention – I just ignore him when he does this. I have read conflicting things about high energy dogs though. I don't think he could be underexercised as he gets about two hours a day all up and he really is only little (7.5kg). Some people suggested as you have, Judy, to walk him less. But other things I read imply he needs more exercise. As usual, internet research is my best friend and worst enemy. We have had a couple of good walks recently. I bit the bullet and tried a 7am Sunday walk. No one around and it was quite relaxing and beautiful. Recently we have also tried a fun game. I throw treats into the street for him to hunt and chase for when we see another dog. It seems to be working as a distraction mechanism if nothing else and it's easier than trying to hand-feed him. I have bought him a muzzle and am trying to train him not to fight it. We are one day in but hopefully he accepts it so I feel a bit more secure on the walks with other dogs. We also have the issue that he pees in the house about once every few days. At the moment my partner is away and he is doing it every single day, which I think is related. It seems to be out of dominance rather than need. I feel I am doing everything 'right' – taking him out straight away, giving him a treat every time he pees outside. He is housetrained apart from this one weird quirk. Dibby, I am going to buy that book. Thanks for the recommendation. Nettle I will try a double lead, that sounds very reassuring! And honestly he is just on the supermarket dog food, which is probably doing him no favours. If you have any recommendations I'd be pleased to hear them. I am going to try to give it another couple of months before thinking about alternative homing options. That would be really hard on poor Hobbes and also on us. We really are committed to making this work, and as you guys have said a month is not a long time, however much it might feel like it. Hopefully things will improve! Thank you again for being so supportive and kind. The peeing is insecurity not dominance. He wants to make the house smell of him. Clean up with an enzymatic cleaner, not one with ammonia in because that makes the area smell like a great place to pee. Also use a non-ammonia cleaner in the rest of the house too. There are several websites that list dog food ingredients and rate them for suitability, so check out those. And remember - it's early days yet. You sound more optimistic this morning, which is great Once you've just had one good walk, where something has worked, it helps you realise that things are very likely to get better. As for food, a great place to start is https://www.allaboutdogfood.co.uk/ You can put in details of your dog and your budget, and it will suggest good foods (though they might not be available in France). The ideal is grain-free, with a high % of meat (not meat meal or derivatives, though some meat meals are reasonably healthy). Another option is raw feeding - in my opinion and that of other members, this is the best possible diet, and we can give you all the guidance you need. It really is much easier and simpler than a lot of people think. As well as making sure he has enough physical stimulation, be aware that getting his brain working can be even more tiring & help him relax. Have a Google for things like 'clicker training', Nina Ottinson activity toys, 101 uses for a box, interactive dog toys... There's a wealth of suggestions out there. And finally, have a read of this site: https://www.training-your-dog-and-you.c ... ining.html The approach does involve keeping your dog in his comfort zone, which is going to be challenging for you, but if you do what you can, it should help. Have you tried a head halter? I would recommend a comfort trainer or a snootloop but there are many versions and they are all fairly effective. It will take some conditioning but it will remove the scare factor from the walks. My dog reacts positively to some dogs, ignores others and reacts what I can also call aggressively to others (it may be out of fear but treatment is the same). Most aggression is due to fear so your dog is most likely just scared. Also, if you have a friend that has a calm dog you can also try keeping that dog at a distance, let your dog bounce around at it and then once your dog stops remove the other dog. Repeat. Just make sure to not stress the other dog. 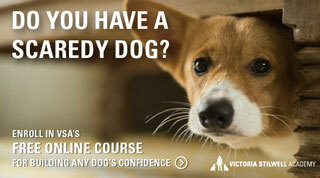 Where I live a few places offer classes for "feisty fidos." Perhaps you can find one or the rescue organization can arrange some help for you! you have gotten some good advice, but I would like to make sure you also have some advice for how to use food in training a dog like Hobbes. 3. you don't need to be "more of a strong leader"
5. you are in some way reinforcing the fear. you can't reinforce fear the way you reinforce a sit, down etc. As already suggested, Hobbes is most likely afraid. This is the safest assumption and safest place to start and base your training on. you will make better choices such as not letting a trainer talk you into punishing or correcting Hobbes when he behaves aggressively. Even trainers who in other training situations would use punishment or a correction, but are up to speed on fear WILL NOT use these methods on a fearful dog. Also, you will not let other dogs come up when you are given a choice. things like that. So what do you do to help Hobbes? your on the right track with trying to use food to change his association. But how we do this is very important. If you are wanting to change associations or what something predicts, which is often the case with fearful dogs, the learning principle is known as Classical Conditioning. while the name may not ring a bell...Pavlov's dogs where the bell caused the dogs to salivate often does. To correctly use Classical Conditioning the first thing to know is this learning principle has NOTHING AT ALL to do with what Hobbes maybe doing, and has EVERYTHING to do with what is happening out in the environment. When Hobbes becomes aware of another dog, we do not care if he is sitting, standing, rolling over, doing a head stand etc. All we care about his he show some sign of awareness of the other dog. Once you see that sign of awareness you start giving food. not just one bit and then stopping. It isn't see dog..get one bit of chicken or hot dog or whatever you are using. it is show awareness and one small bit after another happens as long as Hobbes is showing awareness of the other dog. Only giving one small bit of food per dog is a common mistake. when you do this...scary dog happens, your dog gets a bit of food...then nothing while scary dog is still there...and continues to be there....and oh it is still there etc. so a brief something nice, while a LOOOONG period of SCARY. this won't work to change your dog's association. you MUST be like a "river" of small bits of food while your dog is aware of scary. When scary dog disappears, food stops. when Hobbes stops paying attention to scary dog, food stops. What are signs of awareness? Hobbes looking in the direction of the other dog. often this will be more than just a head turn, but his whole body will orientate to the other dog. his ears will perk up. his tail may go strait up, or become tucked. strait up is more common when the rest of his response is aggressive. his body will become stiff. you may notice him pausing in his breathing. he may not literally stop breathing, but it will look like it. his mouth may close. you want to start learning to catch these very, very early signs of Hobbes being aware of the other dog and then when you see those, the food starts. Do NOT wait until Hobbes is barking, lunging, growling etc. that is too late. When we catch those early signs of awareness of scary dog, we have engaged another behavior principle called Desensitization. Desensitization is where we expose Hobbes to thing that scares him at a level that does not appear to trigger fear or aggression, only the earliest indication of awareness. Combining Classical Conditioning with Desensitization is highly effective in helping fearful dogs. when you are working to change an existing association it is said to be Counter Conditioning. So you may hear what I just described above as CC/DS or Counter Conditioning and Desensitization. Because Classical Conditioning is also good for creating predictions...barking predicts dogs. Since Hobbes is presumably afraid of dogs, if he hears barking that predicts the thing that triggers fear and aggressive behavior, when hears barking his body is already "ramping up" to deal with the fear. So when you hear barking, barking makes food happen. as long as barking is happening, food happens. Same can be said for the jingle that may or may not be another dogs leash and tags around the corner ahead, or behind the fences etc. What to do when he does react? If you are using CC/DS you MUST still offer the food if possible and safe to do so. the reason is we MUST be consistent dogs no matter what make food happen. this is just the way the principle works. HOWEVER..... this is critical, you then must figure out what went wrong and if possible don't let it happen again. if you were to graph the last 10 dog encounters and 1 or 2 of these were cases where Hobbes reacted aggressively then you are moving in the right direction and don't loose sleep over the 1 or 2 where things didn't go well. BUT if you on the other hand had 8 bad encounters and 1 or 2 good, then something needs to be adjusted. Hobbes will not improve when the "it went wrong" happens more than "it went right". Keys...Hobbes shows awareness, and that awareness makes food happen as long as dog is visible, or Hobbes shows "interest/awareness" of the other dog. dog disappears, Hobbes stops showing awareness/interest, food stops. Also...keeping as much distance as you can, so that Hobbes doesn't escalate to aggressive behavior. Another option, and one that might work a little better if you have limits to the amount of space you can get, is to teach Hobbes a cue that means turn and look at you and hold that look. So you say for example "watch" or "look" and Hobbes know that means to turn and look at you as you walk way from where the other dog is. This option works well if Hobbes appears to get "tunnel vision" and can't break his look away from the other dog and the more he looks, the more agitated he becomes. OR if you simply can't get the distance you need to use CC/DS affectingly. Unlike with CC/DS you actually do NOT have to wait until Hobbes see or shows awareness of the other dog. this is handy when you know the other dog will be passing close and at this stage that is too much for Hobbes. you can proactively ask for him to "look" at you, and a river of YUMMY food (hot dog, chicken, something super good that he LOVES) flows to him as you move for distance. The reason you can proactively use this option is because the learning principle is the same as sit or down. Hobbes will KNOW the other dog is there, but you are providing an alternate behavior to do verse bark, lunge etc. When possible, you will want him to show awareness of the other dog before you ask for the "look". But when needed you can ask for it proactively. you will want to build this up before "taking it on the road" so to speak. unlike CC/DS which you can start NOW, this second option requires training an building a behavior before you actually can use it when a dog is around. I would encourage working to have both options as something you can use. Reinforcing fear. If someone tries and tells you what you are doing is reinforcing the fear, and what you are doing is what I described above, thank them for their advice...then ignore it. IF you are doing something that reduces the fear, which could include holding your dog as some dogs when held do feel safer, then they are moving out of fear into a sense of safety. you can NOT experience safety and fear at the same time. I have discussed this with experts in behavior, the ones that experiment and come up with these principles that we use to help our dogs and they confirm you can NOT reinforce the fear using the principles I shared with you. Lastly. No one is perfect at this stuff starting out. it is a developed skill. as long as you are truly close, close is close enough BECAUSE you will continue to work to be better at your timing of food delivery, coordinating the leash, walking away etc. like learning to play a musical instrument, or playing a sport, or learning to write software, the more you practice, the better you will be. please, please ask any questions you may have. it's a lot to take in and try and remember.